On June 14, 2012, I was on Alaska Airlines flight 504, heading to John Wayne Airport, and I noticed the flight attendant (Pam) wearing a “We Proudly Serve Starbucks Coffee” pin on her uniform. I commented that I liked it. 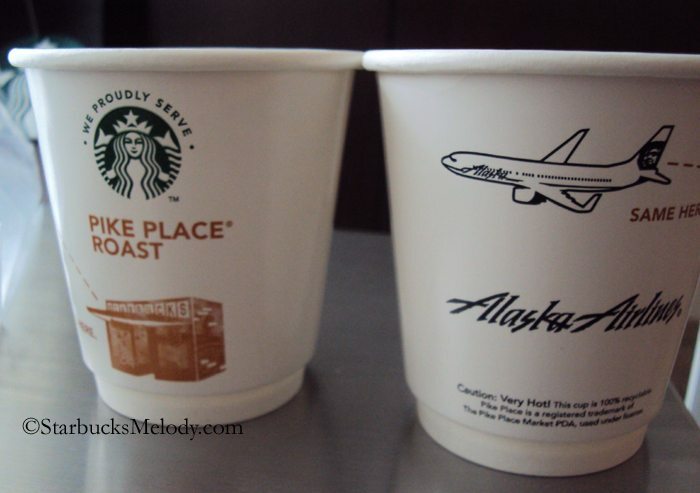 She replied by explaining that Alaska Airlines only recently began serving Starbucks coffee on their flights. I oohed and awed over the pin, and she smiled, pulled it right off her uniform and gave it to me. I thought that was pretty nice of her! 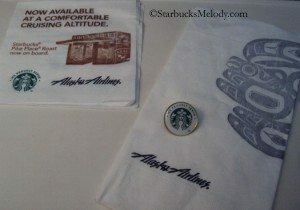 I like the co-branded napkins too with the 1912 Pike Place image on them. There is a part of me that feels proud of this relationship between the two brands. About 20 years ago, I started flying Alaska religiously because they’re the only airline with non-stop flights between SeaTac Airport and John Wayne Airport. That flight comprises 90% of my travels, and to this day, they’re still the only non-stop carrier between those two airports. I don’t expect others to be as tickled pink as I, nonetheless I want to share what the pin, napkin and cups looks like. 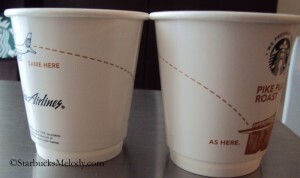 The cups are particularly clever because of the graphics (dashed line) that connect the image of 1912 Pike Place to an airplane in the sky, and the words, “Same here … as here.” I found a brief mention of this new partnership in the June 2012 edition of the Alaska Airlines magazine. I have a few more articles coming soon related to this California trip. I just thought I would start with this short one. 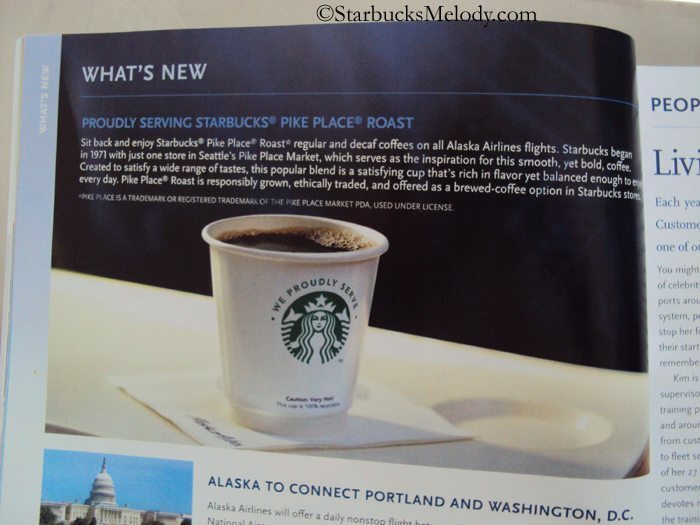 And yes, I did enjoy a cup of Pike Place Roast on the flight. Follow Alaska Airlines here on Twitter. Disneyland (California Adventure Park) gets its first Starbucks! A coffee tasting with Indivisible Blend at the Starbucks at Westlake and Denny. 10 Things you need to know about Starbucks. Reminder: Tales of the Siren: A StarbucksMelody book signing event tomorrow! What a nice surprise to see this on your flight. I can’t remember such promotions like these on airlines I have flown. Oh I’m so jealous now! I flew on AK air last month and they were actually serving it on both my flights but they didn’t have any of the cups or napkins yet. Fun! Horizon has offered free Starbucks coffee on their flights, and in gate areas, for quite some time. Alaska served Seattle’s Best in the past, but I’m glad they switched over to Starbucks. I almost never get to fly Alaska, but kudos to them for picking up this Horizon tradition. I remember the TV ads when United started serving Starbucks … customers following a guy carrying a burlap bag of beans through O’Hare airport. I loved the ad, but unfortunately it seems that serving Starbucks was one of the things lost in the United-Continental merger. Wow, super cool. How nice that she gave you her pin!! Love it all. Ooh, very nice, actually surprised Starbuck’s doesn’t have more airline arrangements. In the very least, when I fly to Michigan, Heathrow has a Starbucks in the terminal. But it would be awesome if I could sip some Pike Place on my Delta Flights. @Denise – I think that was like the early 1990s when United started serving Starbucks coffee! Alaska has been through several different coffees. 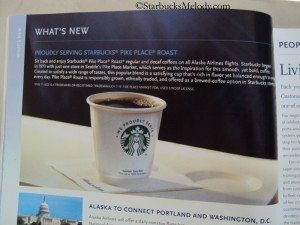 I recall that briefly they tried serving a blonde roast of Starbucks (Veranda) – I think I had that on a prev trip to Calif. The flight attendant told me the blonde had been her favorite! And then for a while that had a Seattle’s Best Coffee. 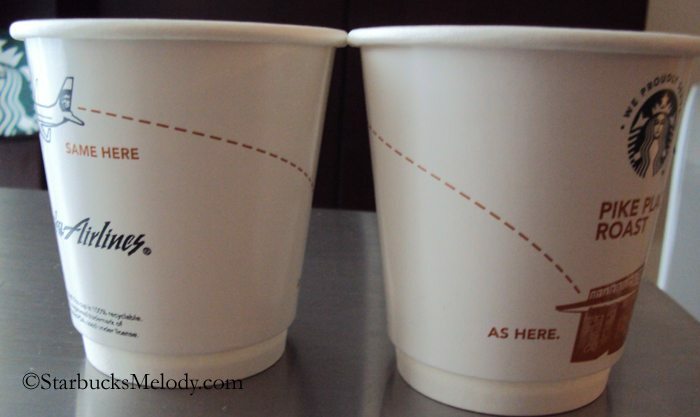 And now, Pike Place Roast with a lot more promotion in the napkins and cups.